There is a quantity known as the "Equilibrium Climate Sensitivity" or "ECS" that serves as a traditional measure of the warming effect of greenhouse gases. The ECS characterizes the total warming we would expect from a doubling of the concentration of greenhouse gases (e.g. from the pre-industrial level of 280 parts per million to the 560 ppm level that would be expected by the middle of this century if we continue with the unabated burning of fossil fuels) once the climate system fully adjusts to this increase. While ECS is defined in terms of the response of the warming response to greenhouse gases it is a more general measure of how the climate responds to any external forcing, be it human (i.e. greenhouse gas increases) or natural (e.g. a change in solar output or the response to an explosive volcanic eruption). I provided a review of the concept in this 2014 Scientific American commentary. The figure featured in this post, taken from that commentary, shows the collective information we have about the ECS from numerous lines of evidence. These lines of evidence range from the cooling at the height of the last ice age 25,000 years ago, to past geological warm periods millions of years ago, to the cooling response of the climate to short-term volcanic eruptions, to the emergent climate sensitivity observed in numerical climate models. This collective evidence suggests a likely (68%) range of 2-4C warming [the Intergovernmental Panel on Climate Change (IPCC) 4th assessment report reported a slightly higher 2-4.5C likely range (shown in the figure by the gray shading)]. The best (i.e. most likely) estimate of ECS in these collective assessments is very close to 3C, well in excess of the typically ascribed 2C "safe" planetary warming limit. The strength of these assessments of collective evidence is that they are robust--they are resistant to the potential deficiencies in any one particular line of evidence. And indeed, it is easily possible for any one line of evidence to be biased or otherwise unreliable. 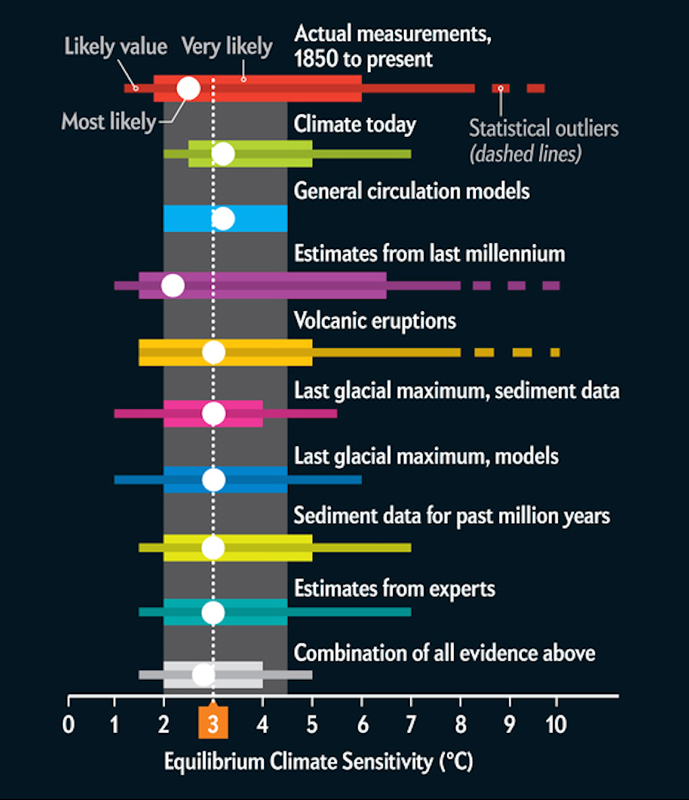 The lowest estimate of ECS (roughly 2C) from all of the different lines of evidence summarized in the figure above comes from comparing model simulations and paleoclimate temperature reconstructions spanning the past millennium. This is an area of climate science where I myself have done a fair amount of work over the past two decades (and it is not entirely without controversy). In recent years, my collaborators and I published a series of articles (here here here and here) suggesting that the paleoclimate reconstructions may underestimate the response of the climate to very large past explosive volcanic eruptions. Since these events exhibit substantial leverage in the model/data comparisons, such an underestimation would lead to an underestimation bias in ECS values derived from these comparisons. Indeed, simply removing them from the comparisons yields substantially higher ECS estimates that are very close to the canonical value of 3C. Regardless of the precise reason for the discrepancy, however, it underscores why we seek inferences into ECS from multiple independent lines of evidence. Now, with great fanfare (see e.g. this Washington Post coverage ") comes a new study in the journal Nature by Cox et al that purports to have reduced the upper end of the "likely" ECS uncertainty range from 4 or 4.5C down to 3.4C. That would be good news if it were true. But I have severe doubts it is, as I have some technical reservations about the study. My first concern is that internal climate variability can’t be accurately modeled by a simple first-order autocorrelated process, which is the foundational assumption behind their approach. There are phenomena, such as El Nino, that defy such a characterization, and render an approach which assumes a direct relationship between climate sensitivity and internal variability somewhat dubious. Indeed, I co-authored a study that demonstrates shortcomings in this sort of approach some years ago [Foster, G., Annan, J.D., Schmidt, G.A., Mann, M.E., Comment on "Heat Capacity, Time Constant, and Sensitivity of Earth's Climate System" by S. E. Schwartz, J. Geophys. Res., 113, L22707, D15102, doi: 10.1029/2007JD009373, 2008]. My second technical concern is that the authors use a simple detrending procedure to estimate the internal component of climate variability. Such a procedure will fail to remove the complicating effects of forced variations (due to volcanoes, solar output changes, and some of the human impact on climate). We’ve demonstrated that problem in a series of peer-reviewed publications in recent years, showing that a more sophisticated approach is necessary to separate forced and internal climate variability [Mann, M.E., Steinman, B.A., Miller, S.K., On Forced Temperature Changes, Internal Variability and the AMO, Geophys. Res. Lett., 41, 3211-3219, doi:10.1002/2014GL059233, 2014; Steinman, B.A., Mann, M.E., Miller, S.K., Atlantic and Pacific multidecadal oscillations and Northern Hemisphere temperatures, Science, 347, 998-991, 2015; Frankcombe, L.M., England, M.H., Mann, M.E., Steinman, B.A., Separating internal variability from the externally forced climate response, J. Climate, 28, 8184-8202, 2015]. A better approach would have been to use the control (unforced) simulations, which provide pure estimates of the internal variability characteristics of the models, as we did in another recent article [Cheung, A.H., Mann, M.E., Steinman, B.A., Frankcombe, L.M., England, M.H., Miller, S.K., Comparison of Low Frequency Internal Climate Variability in CMIP5 Models and Observations, J. Climate, 30, 4763-4776, 2017]. My technical quibbles with this particular study are not the primary point here (and if critiques of the study are what you're looking for, you can find more elaborate ones here and here). My main point here is that a single line of evidence, let alone--as in this case--one single study, is extremely unlikely to fundamentally alter the collective weight of evidence regarding our understanding of ECS. And it does not change the fact that we cannot rule out ECS values as high as 4.0C or 4.5C, and the considerable risk that comes with that. Ironically, just last month the Washington Post published a piece entitled "The most accurate climate change models predict the most alarming consequences, study finds" describing a recent study by Brown and Caldeira that comes to the opposite conclusion. Assessing which climate models do the best job in matching the observed balance of energy within the climate system, they determine that the likely range for ECS is substantially higher than the conventional estimates, arguing for a likely range of 3.0-4.4C. Indeed, there are a number of studies that have been published in recent years coming to a similar conclusion (I discussed them in this post at RealClimate.org). Yet for some reason, the latest study seems to have garnered considerably more attention. Perhaps this is because the media narrative of "it's not as bad as you think" may seem attractive and fresh in an environment where we seemingly hear too much gloom and doom, or because the study's authors encouraged that framing in their press release. Or perhaps it's because the climate change denialosphere saw in this study a finding they could cherry-pick and misrepresent to dismiss concern over climate change, and helped promote that distorted framing via the right wing media megaphone. Regardless of why, we are left to contend with the "whiplash effect" described by journalist Andrew Revkin where institutional press releases and media framing play up, and often overstate, the implications of any one study, leaving the public to think that scientific understanding fluctuates like a weather vane, constantly turning in the direction of the latest study. That is simply not how science works. Individual studies typically provide at best an incremental change in our understanding. And we do a disservice to the scientific discourse when we allow it to be framed by the latest press release. Returning to the case at hand, there is really nothing in this latest story that modifies in any meaningful way our understanding of the sensitivity of the climate to the ongoing burning of fossil fuels, despite widespread claims to the contrary. If I seem overly sensitive about this topic, you hopefully now understand why.